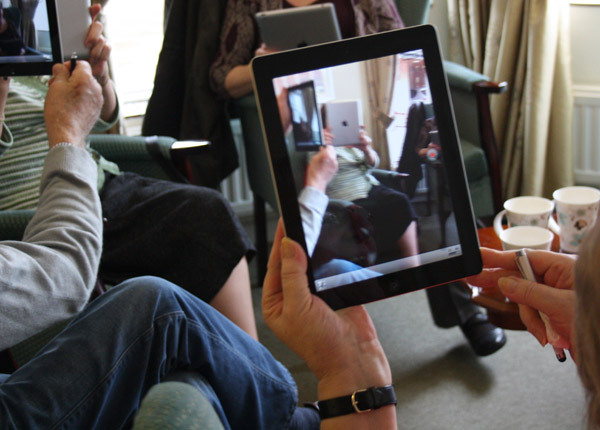 As part of the PORTAL project, we’ve been working with Tenantspin to deliver workshops supporting sheltered housing residents in using iPads. Our approach to this has been to frame the device as the latest step in a series of technological innovations experienced in the life-times of the residents. We have also been discussing possibilities of telepresence, and the ideas expressed through science fiction literature and film, to question to what extent these devices are now present in our everyday lives. This week we looked at using the video camera function of the iPad, with a view to recording video messages. Moving image recording technology has evolved immensely over the life-times of the residents, from film cine-cameras, to home video, then digital cameras, to a point now where it is integrated into other devices as a default. The pervasiveness of video recording, as part of a mobile phone or an iPad, is enhanced further by the fact these devices are designed to share media that is created (or collected), and also integrate various functions (eg – using video across apps). 1. Simply turning the camera on. This transforms the iPad into a window, a portal by which the outside world can be framed, immediately placing the user in the role of author. The scale of the iPad image itself is not too far removed from the real world as viewed by our own eyes, creating an odd kind of harmony between the image and it’s surroundings. It was a remarkable scene, with 6 residents sat in a circle, all viewing each other through the iPad camera, looking slightly enchanted. This gave the residents control over roles as presenter / director. It’s sometimes a bit of a shock for us to see ourselves in the magic mirror, but it’s also captivating. There is an odd reflexivity to recording yourself and seeing yourself at the same time – it’s something that Skype users will be familiar with. The value is in being able to send your self to another user, with all the detail that comes from reading a face. 3. The ability to move freely with the iPad. It is enabling – we are not peeking through a view finder – it’s size makes it easy to handle and guide it smoothly. The residents conducted tours of the home, gliding round the space, speaking about the details as they went. Exploring a familiar space through a lens, knowing it it being captured, and narrating it for an intended viewer – these things create a real engagement with your surroundings. Seeing something you just recorded is enjoyable – sometimes the moment captured can feel more real than being in the moment itself. It can be replayed, scrutinised. Most importantly it can be shared. As soon as the residents had recorded their videos, they did two things: played it back to themselves, then played it back to someone else. The size of the screen makes this immediately accessible. Bill even clocked on that we could play it back via the tv using a hdmi adaptor. Sharing something that you witnessed is as old as cave paintings, (or perhaps slideshows at least!). It creates community. The residents really got something out of exploring the camera. With some we created video messages – a video answer phone – and with others we used it as a tool to explore the home. The value in immediately creating your own media is apparent, and the iPads fusion of the camera / screen make this incredibly accessible for older people.